Hay preservatives can reduce the spoilage and heating losses from hay baled wetter than optimum. First, it is important to recognize that two totally different types of products with different modes of action are sold: one is a desiccant which is a compound applied to the hay at cutting to increase drying rate and the other is a preservative which is applied to hay as it is baled to allow baling of wetter than normal hay without spoilage during storage. Both products are usually applied through a spray system, either on the mower (for desiccants) or on the harvesting equipment (for preservatives). Potassium or sodium carbonate are effective desiccant’s. These compounds disturb the waxy cuticle of the alfalfa stem to allow it to dry faster. Desiccants work only on legumes such as alfalfa, trefoil, and clovers, not on grasses. Effectiveness varies with climatic conditions. Desiccants reduce drying time most when drying conditions are good. Thus, they tend to work better on second and third cuttings in Wisconsin. They are seldom used due to the large volume of water that must be applied along with the desiccant. Preservatives are applied to the hay as it is harvested to prevent heating and spoilage of hay baled at higher than 14 to 18% moisture content. Preservatives are cost effective if used only when needed to prevent rain damage to hay and if applied uniformly to windrow as it is entering the baler. The most effective preservatives for alfalfa are organic acids, primarily propionate (propionic acid) and acetate (acetic acid). Any preservative containing a high percentage propionate (propionic acid) will be effective. Use of ammonium propionate (also called buffered propionic acid) rather than propionic acid is recommended because the product is less caustic – therefore safer to handle and less corrosive to machinery. When purchasing preservatives, compare cost on a per pound of propionic acid basis. Other additives do little if anything to preserve hay. Hay preservative products that dilute the propionic acid require greater product use rates. 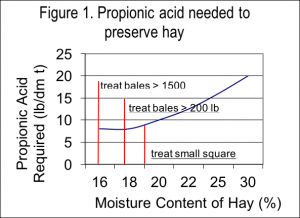 Rates of propionic acid required to preserve hay vary with the moisture content of the hay. 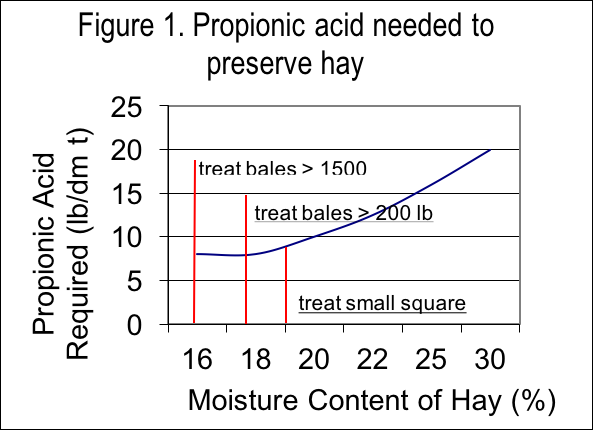 As indicated in Figure 1, the amount of propionic acid required varies from 8 lb/dm ton for hay with less than 18% moisture to 20 lb/dm ton for hay with over 25% moisture. Note that rates are for pounds of propionate not product. Therefore, a product with 50% propionate would need to be applied at twice the above rates. Acetic acid is about half as effective as a preservative and therefore requires twice as much product for equal preservation. Use of preservatives for hay above 35% moisture is not recommended. Anhydrous ammonia is an effective preservative for grasses. It can be injected into bales or released into a stack of bales covered and tightly sealed with plastic. Ammonia should be applied at the rate of 20-40 lbs/ton with higher rates used for hay near 35% moisture and lower rates used when moisture is near 20%. Anhydrous ammonia should not be used as a preservative on alfalfa because the additional nitrogen is of little benefit to animals and toxic chemicals can form in the hay. No microbial hay preservatives have been shown to be effective in preserving hay. Preservatives should not be necessary when making baleage (plastic wrapped bales) since the oxygen is necessary for mold growth and the plastic should prevent oxygen from entering the bale.